On 19 July, 1989 Kenya burned its 12,000 kilogram (26,455 pounds) stockpile of ivory so that it could never be sold and would not stimulate demand for products from the recently protected African elephant. Although the Asian elephant had been a protected species since 1975, listed on CITES Appendix I which prohibits international trade of live animals or its parts, the African elephant only gained the same protections in 1989. 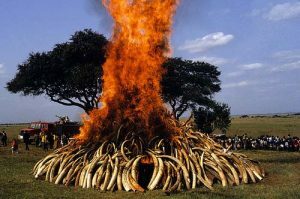 Kenya’s ivory burn showed the international community that it was dedicated to ending the eradication of African elephants, which across the continent had fallen from 1.3 million in 1979 to an estimated 600,000 in 1989. Kenya’s own elephant population had fallen from roughly 167,000 in 1973 to an estimated 60,000-71,500 in 1977 and today the country, along with several other African nations, remains a strong opponent of any international trade in ivory. To date at least 20 countries, as well as the Hong Kong Special Administration Region, have voluntarily participated in ivory burns or crushes. Central Africa and East Africa were major sources of ivory throughout the 1900s and sold the raw or partially-worked ivory to dozens of nations world-wide. Prior to the international trade ban most ivory had been purchased by Japan, the United States, and Europe (To Save an Elephant by Allan Thornton). Today China and Japan are thought to be the largest markets for ivory, but the United States may continue to be a major importer of worked ivory from China and of mammoth ivory from Russia. Ivory is also highly prized throughout Southeast Asia and antique ivory is still legally sold throughout the world. Since the first ivory stockpile burn several other nations have joined Kenya in destroying their stockpiles, described in the list below. By 2015 more than 100,000 kilograms of ivory have been destroyed to prevent it from contributing to strong ivory demand. However some Asian and African nations have petitioned CITES to allow a one-time sale of ivory stockpiles from specific African nations. 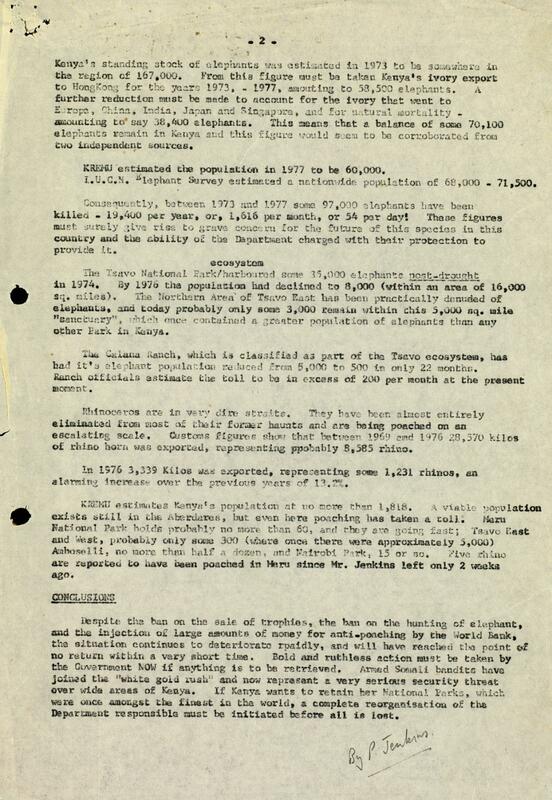 The first one-off sale was approved in 1997 and Botswana, Namibia, and Zimbabwe sold government-held inventories (page 12) of ivory weighing 49,574 kilograms (109,292 pounds) to Japan. The sale was valued at roughly $5 million or about $100 per kilogram of raw ivory. A second sale occurred in late 2008 (page 12) and South Africa joined Botswana, Namibia, and Zimbabwe in selling 107,770 kg (237,592 pounds) of ivory to China and Japan. The sale was valued at nearly $15.5 million or around $140 per kilogram of raw ivory. Total ivory burned or crushed ≥ 249,605.6 kg Figure includes only 1,000 of the 29,600 kg claimed destroyed by Hong Kong and an estimated 1,800 kg from the U.S. in August of 2017. The Hong Kong Special Administrative Region of the People’s Republic of China has carried out its own ivory crush, independent of its national government and is listed separately in the chart above.